Solar panels are great, but they can be a bit... well, bland sometimes. We can't argue with their benefits, but unless you've a keen eye for photography, they aren't really works of art. Apart from Synthesis Design + Architecture's (SDA) solar pavilion of course, because that's most definitely a work of art. It's called the Pure Tension Pavilion, the result of the "Switch to Pure Volvo" competition launched by Volvo Car Italia and organized by international architecture magazine The Plan. 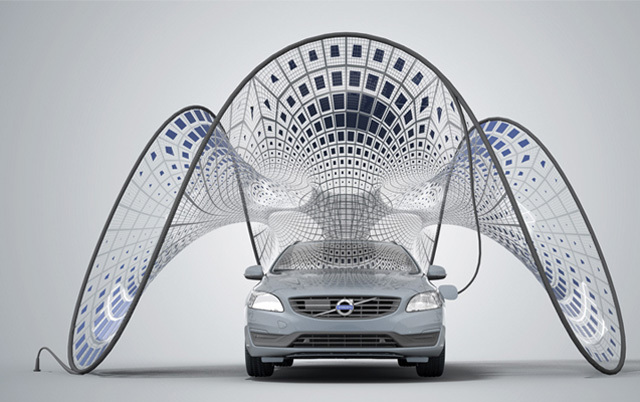 The brief was to construct a temporary pavilion that expressed "a strong and creative identity" to showcase the Volvo V60 Plug-In Hybrid--the world's first diesel plug-in hybrid production car--at open-air fairs and presentations. SDA's design uses a high density polyethylene (HDPE) mesh skin with integrated photovoltaic panels, stretched over a web of carbon fiber rods. The result is a construction straight out of science fiction and a work of beautiful sculpture, but one with practical attributes too. Not only does the pavilion charge the Volvo V60 while it sits there at fairs and similar, but its collapsible nature means it can be folded away and stored in the V60's trunk--ready to be transported to the next event. SDA says it emphasizes "the qualities of dynamic form, interactivity, visual impact, functionality, and efficiency to create a novel temporary structure that while iconic also offers high-performance". Seems fair enough to us, though Treehugger sees it as much more than a glitzy display for a new Volvo. They could be right. If the lightweight setup proves efficient, there'd be little to stop companies offering something similar as an electric vehicle accessory--ready to top up your battery wherever you stop. Currently in development, the Pure Tension Pavilion will go on display in Rome on September 15, 2013.